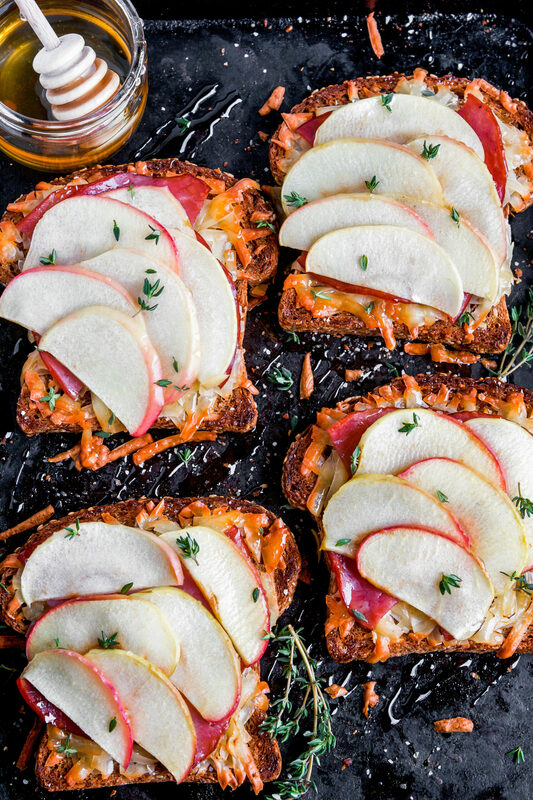 This apple toast screams fall through-and-through. 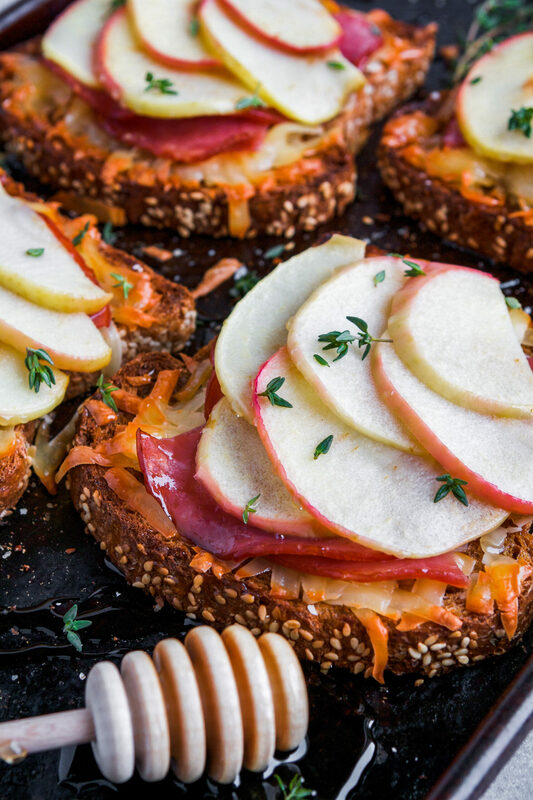 Top toasted whole-grain bread with creamy smoked Gruyère, salty ham, and slices of sweet Honeycrisp apple. 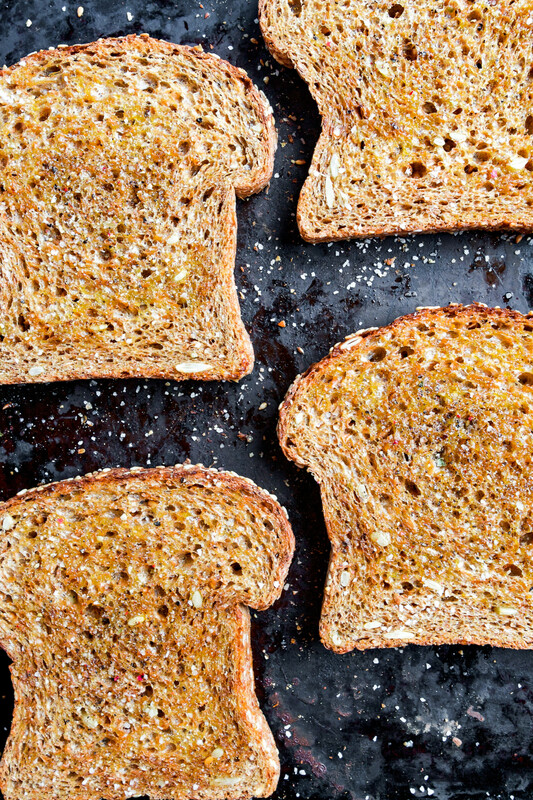 Broiled to melty perfection then finished with honey and earthy thyme, these toasts are perfect for breakfast, lunch, or dinner. I just made a huge pot of roasted root vegetable soup (a slight variation from this recipe) and I think that’s a sign that I’m finally ready for fall. What are you most looking forward to cooking this fall? 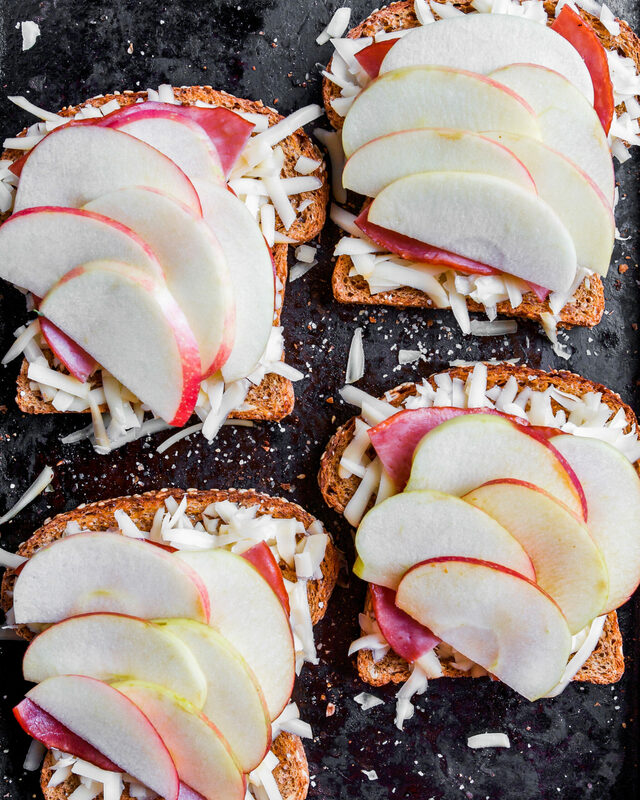 I’m currently loving anything apple, especially this apple toast. It’s savory, slightly sweet, and wonderfully herbaceous thanks to fresh thyme. 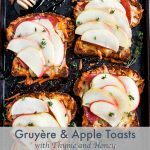 For these toasts, I like to use Honeycrisp apples for their crispness and sweetness, it pairs perfectly with the salty Gruyère and deli ham. Then just finish with drizzle of honey and some fresh thyme. If you don’t have thyme on hand, you can use rosemary or sage too! Spring most often holds the title of being the season for fresh starts and new beginnings. And there’s no doubt a sense of rebirth sets in as the snow melts and we begin to crawl out of hibernation. But this past weekend it dawned on me that as summer has slowly faded away, I’ve experienced similar feelings of reset and rejuvenation. However, instead of revving up and increasing the pace, it’s as if I’m slowing down, finding more patience, and taking a step back to appreciate the mundane aspects of life. This past Sunday was the first day in the past few months that was a clean slate for us. Nothing in the house to work on, no recipes to develop or photograph, no projects to finish up, nothing on the agenda. You can imagine the anxiety it caused me! Seriously, it was a bit uncomfortable not knowing what to do with myself. But it was exactly what Greg and I needed—a slow morning of coffee and CBS Sunday Morning. We eventually found ourselves driving just out of the city to a winery—in what seemed to be the middle of nowhere—for live music, wine, and cheese. It was the epitome of a perfect Sunday afternoon. The music was fantastic, the wine was pretty good for being Iowa wine, and the weather couldn’t have been better (although I could have done without the bee sting). This toast screams fall through-and-through. 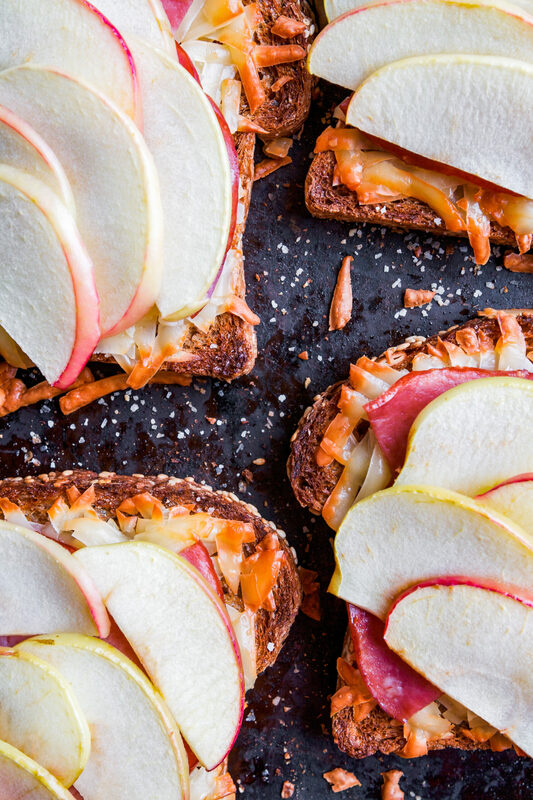 Toasted whole grain bread gets topped with creamy smoked gruyère, salty ham, and slices of Honeycrisp apple. 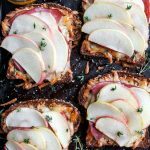 Broiled to melty perfection then drizzled with honey and earthy thyme, these toasts are perfect for breakfast, lunch, or dinner. Heat broiler to high with rack set to upper middle position. Brush both sides of bread with oil and season with salt and pepper. 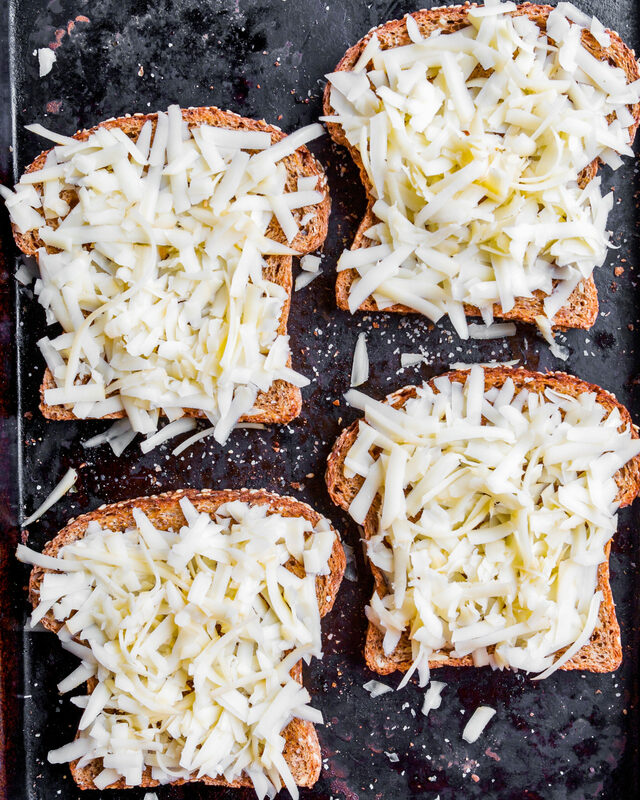 Arrange on baking sheet and broil until lightly toasted on both sides, 1–2 minutes each side. Transfer bread to a cutting board and arrange ham on baking sheet, broil until starting to brown, 2 minutes each side. Transfer to a cutting board and cut each slice in half. 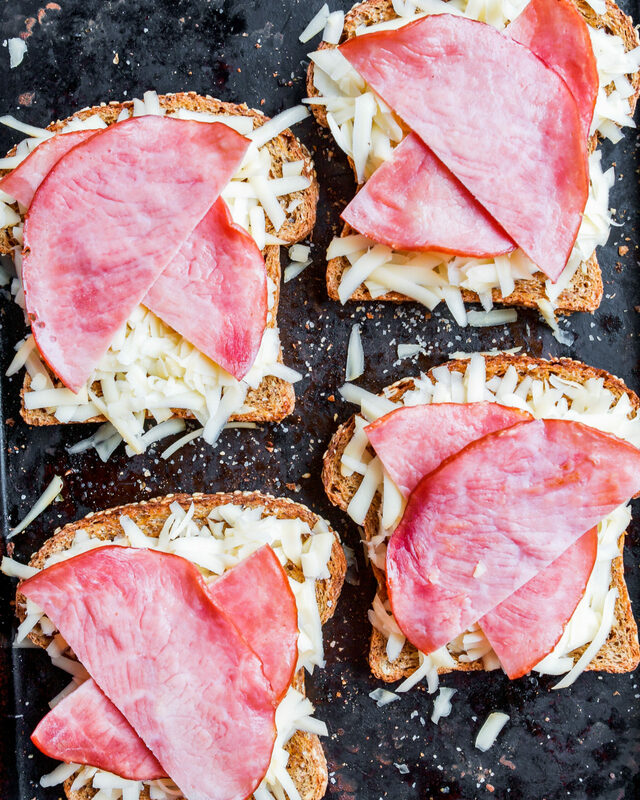 Divide gruyère among bread slices, top with ham and apple slices and broil for 3–4 minutes or until cheese has started to melt. Remove from the oven, drizzle with honey, sprinkle with thyme and season with salt and pepper. Serve with additional honey and thyme. I hope you enjoy this recipe, it’s one of my favorites. Happy Thursday! This looks delicious and would be great also with tofu or tempeh for a veggie sandwich! Denise, that’s a great idea! I think tempeh would be delicious! these look fantastic! great for an easy app! I’ve found that I’ve slowed down since summer, but have had way more time to work on my blogging projects! it’s been amazing! Made these for dinner this week! So yummy with a big fall salad.